Skye Gravestones | Joseph & Mary MacPherson. Alex. & Mary Finlayson. Joseph & Mary MacPherson. Alex. & Mary Finlayson. 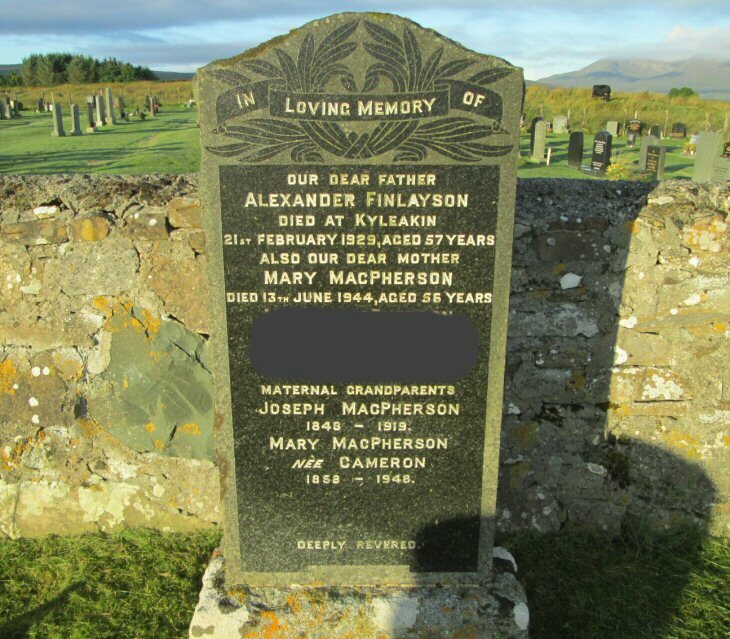 In loving memory of/our dear father/ALEXANDER FINLAYSON/died at Kyleakin/21st February 1929, aged 57 years/also our dear mother/MARY MacPHERSON/died 13th June 1944, aged 56 years/["recent"]/maternal grandparents/JOSEPH MacPHERSON/1849-1919/MARY MacPHERSON/née CAMERON/1858-1948.